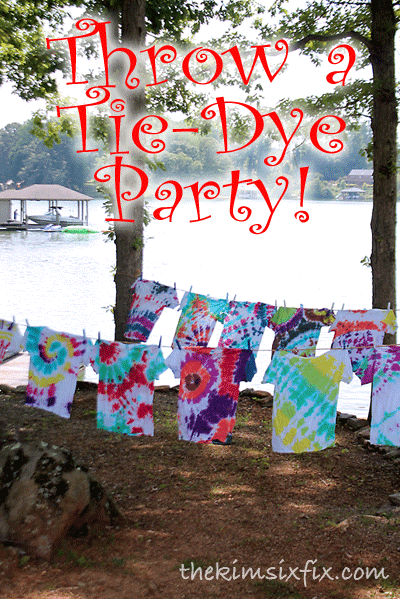 Throw A Tie-Dye Party with Tulip! I want to thank Tulip and Blueprint social for sponsoring this post. Every summer we take a trip back to the East Coast to spend some time with my family. We are always looking for fun party ideas for when the whole group of us get together. My parents live at the lake, so activities that you can do outdoors are always a priority. Tulip sent me their Super Big One-Step Tie-Dye kit and some white cotton t-shirts. Along with some water, those are ALL the supplies you need for this activity. The kits are all inclusive. Tie dyeing was great for everyone in the family.. Grandma, grandpa, mom, dad and all the kids could get in on the creations. Once the dye was applied we stuck the shirts in zip-top bags and allowed them to soak overnight. The longer they sit, the richer the color. The next day we rinsed them and ran them through the washing machine. I was impressed with the richness and color-fastness of the dyes. Other times I have tie dyed with food coloring and other dye types, the shirts faded after the first wash, but that wasn’t the case with Tulip. You also can find additional inspiration on the Tulip Tie Dye Website, their Facebook Page, Pinterest Page and Blog. And you can also find them on Twitter. So what types of family activities have you been up to this summer? Have you ever considered tie dye?